BOG continued its work on the Ubit Restoration Project. This time, the scope of work covers the supply and fabrication of Fire Water Fibre Glass Re-inforced Plastic (FRP) piping works. Earlier (last year), BOG had completed the Onshore scope (Aveon) for the same project. 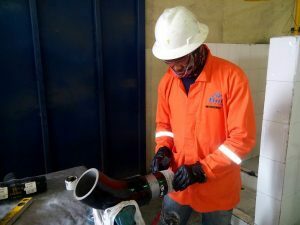 This had involved the fabrication, installation and hydrotest of Glassfibre Re-inforced Epoxy pipes (GRE) and Copper-Nickel (CuNi) materials. The Ubit Field is located in Oil Mining Lease (OML) 67 southeast of the Niger Delta. It is a Joint Venture (JV) of the Nigerian National Petroleum Corporation and Mobil Producing Nigeria (MPN). Ubit has approximately 2.4 billion barrels of oil. In preparation to commence work on the Fire Water Line scope of the project, a kick-off meeting was held on 10th January 2019 and actual fabrication commenced on 14th January 2019 at the BOG Composite Pipe Spool Yard, Port Harcourt. This scope involved provision, fabrication/installation, engineering, procedures, equipment, manpower, procurement of materials and consumables and shop fabrication of FRP piping. 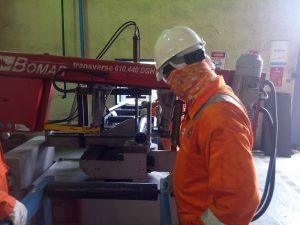 At the moment, we have reached 71 per cent of fabrication work; 454 joints out of 639 joints. While fabrication continues, some modifications of the overall design of the project are also being made. Above and below: BOG engineers during fabrication of spools for the Ubit Restoration Project (Fire Water Line Scope).